After two days of early voting it is clear that voters in Texas are fired up and coming to the polls in VERY heavy numbers. Interestingly enough we are also starting to hear of problems at polling places. Some of these can be attributed to possibly innocent human error, while in some other cases there is potential evil intent in action. We have heard of some incidents in Dallas County and in Harris County which we are looking into. But there are also things you, as voters can look out for and opportunities for you to help. In Dallas County, it was reported yesterday that in a few locations, Eddie Bernice Johnson's name was the only name on the ballot for CD 30. Somehow Stephen Broden's name was not on the ballot. Dallas County is being very cooperative in investigating this claim, and we should have more information soon on this. I will report back as facts develop. In Harris County (Houston) two locations reported problems in the Texas Legislative District 148 race between incumbent Democrat Jessica Ferrar and her Republican challenger Fernando Herrera. Several people reported not being able to find Fernando Herrera's name on the ballot. It was not clear if they saw Jessica Ferrar's name or if the entire race was missing from their ballot. This has also been reported to Harris County for investigation. In this case it is quite possible the voter was issued a ballot code for the wrong "ballot style". In Harris County, when you check in at the first stop and identify yourself as the voter, they print out a ticket for you to sign as the voter. This ticket contains a "ballot style" code which determines which ballot you will see on the machine when you vote. The next step is where you are given the ticket with a code you enter at the voting machine. This device is called a JBC (Judges Booth Controller). The operator of the JBC is supposed to correctly enter the "ballot style" code into the JBC and print out your voter authorization code which you enter into the e-slate voting machine. If that person enters the code incorrectly, you will see an incorrect ballot when you vote. Yesterday we also heard from a voter who said, "I voted today on Tuesday the 19th at Acres Homes Civic Center. I voted a straight Republican ticket and when I was reviewing my ballot (before casting my ballot) it said in red "no selection" next to some races. I chose to scroll back through my 14 pages of votes to see what was not marked as a selection. I got all the way back to the page where the governor race was and should have been marked, but there was no choice marked for governor even though I had chosen and marked straight Republican ticket. So the e-machines are not working correctly and all voters should be aware and cautiously review their choices before casting their ballot." It is possible this voter could have made changes to the ballot while scrolling through to the bottom of the ballot. After voting a straight ticket vote, the e-slate machine does allow you to "un-vote" specific candidates and either change your vote to the other candidate or record "no choice" for that particular race, all the while maintaining the rest of your straight party vote. It is very important that you review the ballot selection at the end of the voting process to make certain your ballot reflects your voting wishes prior to hitting the "Cast Ballot" button. If it does not, scroll back up to the particular race and make the changes you want. If you are unable to correct the ballot ask for assistance. For all three of these situations, here is what you can do as a voter. If the candidate you are expecting to see on the ballot does not appear, call the election officials over to your booth and ask for assistance in finding the race or candidate you are wishing to vote for. If they cannot find that person, you may have the wrong "ballot style". In any of these situations, if your ballot does not reflect how you want to vote and the election staff cannot help you correct it, ask the judge to cancel your ballot and start the process over, making certain you get the proper ballot style code. Do not, UNDER ANY CIRCUMSTANCES, let the election staff hit the "cast ballot" button if the ballot does not reflect your vote accurately. Once the "cast ballot" button is pushed, you are done. There is nothing that can be done to fix your vote at that point. Finally, some questionable activity was reported to me about the Ripley House voting location. Campaign workers outside the polling location reported two separate issues of concern. The first involved a couple of Spanish speaking voters who were told how to vote a straight Democrat ticket even though they had not requested assistance. The second involved reports that the voting machines were temporarily down. As you can see from this photo, there is no one voting and the election judge is working on the JBC while on the phone with someone. Hopefully she was on the phone resolving a technical problem. Shortly after this photo was taken and while voters were being told the polls were "closed", a bus full of voters was brought up to the back door of the facility and allowed to vote. Accompanying these voters was a woman who allegedly identified herself as Jessica Ferrar's mother. She was seen at the back door of the voting room wearing her Jessica Farrar shirt, well within the 100 foot marker. Why was she allowed to be "electioneering" within the 100 ft marker? Why were these voters brought in the back door while other voters were told the polls were closed for technical problems? Is this some more Democrat dirty tricks at play? This information has been forwarded to Harris County for follow up investigation. Liberty Pundits reported on 10/19/2010 stories of Poll Watchers being harassed at polling locations across Harris County. According to the story, Catherine Engelbrecht of the King Street Patriots reported that one 65 year old lady was kicked out of a polling location simply for being present. Isn't this a violation of the law? Democrat County Commissioner El Franco Lee allegedly yelled at three poll watchers saying "Why are you here? 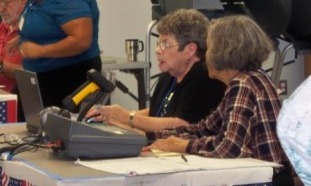 We have never had poll watchers here! You need to get out of here!" In another example of intimidation, Lee allegedly demanded the judge give him the poll watchers personal information causing them to fear for their safety. Is he even allowed in the polling location? Why is it that those who claim to be the guardian of free speech, tolerance and diversity are so intolerant of those whose speech is diverse from their own? If you see something like this happening, call your county election officials immediately and report as many facts as you can gather. Obtain photos if possible and get as much identifying information and date, time and place info as possible. Report it to your county official and to TexasGOPVote.com. We will shine the light on these stories to make certain they are looked into. More Poll Watchers are needed desperately! For early voting and on Election Day. Poll Watchers can be appointed by any candidate or your political party. They have documentation you can use to learn quickly how to do the job of Poll Watcher. CLICK HERE to download the official Texas Poll Watcher's Guide from the Texas Secretary of State's office. Conservatives have been working hard to honestly take back our country through our legal process of voting. Don't let Democrats steal your results! GET INVOLVED WHERE YOU CAN! DO WHAT YOU CAN! But please do it now! Do you mean Hispanic voters or Spanish speaking voters? I think I was thinking about either saying "Hispanic voters" or "Spanish speaking voters" and accidentally blended the two together. Thank you for the correction. It has been corrected in the story. Is Tolerance a Relative Condition? "Why is it that those who claim to be the guardian of free speech, tolerance and diversity are so intolerant of those whose speech is diverse from their own?" Take our country back? to where? Shouldn't we be taking it forward? I've been seeing shirts emblazoned with "Stop Voter Fraud" so I wanted to see what the fuss was about. Here I am. I read about the harassment of poll watchers and how mostly Democrats steal or take down signs. I freely admit that I'm more on the liberal side but I simply came here for information, as stated. I do want your readers to know, however, that I try to be polite and get along with people but I've been simply appalled by the Republicans outside the polls. I understand being fed up. I was fed up with 8 years of Bush. I don't understand otherwise respectable and dignified looking gentlemen and women shouting and swearing without provocation and punching signs and well, just very childish behavior. I saw a very nice young lady spit on. It was my Republican niece who went to the polls with me. I doubt, after watching this spectacle for an hour, that she will ever vote Republican again. Think about that. Please let our civil discourse be civil.